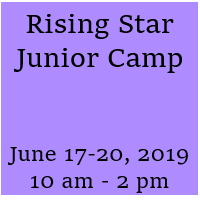 Starstruck’s Rising Star camp is the perfect camp for dancers ages 5 – 12 years old. This camp is designed for the beginning to intermediate dancer who is ready for a fun and educating dance experience. Classes include Jazz, Hip Hop, Lyrical, Poms, Ballet, and Musical Theater. The instructors are made up of Starstruck’s award winning staff and some of Starstruck’s Alumni. We will have a Showcase Performance on the last day! *Please let us know if your dancer has any food allergies! To register or if you have any additional questions please call the front desk Monday through Thursday between 4:30pm – 9:30pm or email us at starstruck@saodance.com . Registration is also available online at www.starstruckdance.com .